On Saturday March 16, 2019, around 12:30 AM, members of the Pomona Police Department's Major Crimes Task Force (MCTF) and the California Highway Patrol were partnered up, and working a gang suppression detail within the City of Pomona. Officers attempted to conduct a traffic stop in the 100 block of W. Kingsley Av., for vehicle code violations. The vehicle came to an abrupt stop and a rear passenger exited the vehicle and began to flee on foot. The Suspect later identified as Michael Lopez Jr began scaling fences within a residential neighborhood. A containment was quickly established with the assistance of Patrol officers. The Pomona Police Airship arrived on scene and began to use their Forward-Looking Infrared “FLIR” camera system to search for the Suspect hiding in rear yards. The Airship’s Tactical Flight Officer began picking up a heat source in a rear yard within our containment. The Airship began coordinating the searching Officers to this heat source. Inside of a closed refrigerator, the Suspect was located hiding. The Suspect was taken into custody without incident. 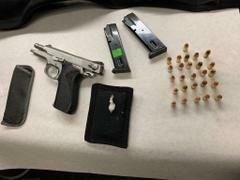 Officers began searching the immediate area for any discarded contraband and located a loaded firearm. A second gun magazine along with narcotics was located on the Suspect. Suspect Lopez was booked at the Pomona City Jail on the above-indicated charges. The City of Pomona is dedicated to addressing quality of life issues and often uses department wide resources to accomplish one common goal of ensuring the safety of our community. If you prefer to provide information anonymously, you may call "Crime Stoppers" by dialing (800) 222-TIPS (8477), use your Smartphone by downloading the “P3 Tips” Mobile APP on Google play or the Apple App Store or by using the website http://lacrimestoppers.org.